Courageous, confident and vital, the Pantone colour of the year for 2011, Honeysuckle, is a brave new colour that will infuse, lift and carry you through the year. Pantone 18-2120 Honeysuckle emboldens us to face everyday troubles with verve and vigour. A dynamic reddish pink, Honeysuckle elevates our psyche beyond escape, instilling the confidence, courage and spirit to meet the exhaustive challenges that have become part of everyday life. 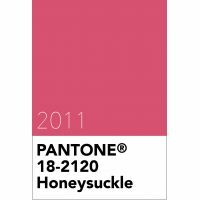 Pantone 18-2120 Honeysuckle is from the Pantone Fashion, Home + Interiors colour library.